Paper Pawz: Simon Says: Anything But a Card! Simon Says: Anything But a Card! This week Simon Says: Anything But a Card! The design team is featuring My Favorite Things products, it isn't a requirement to use them but if you have them we would love to see them! 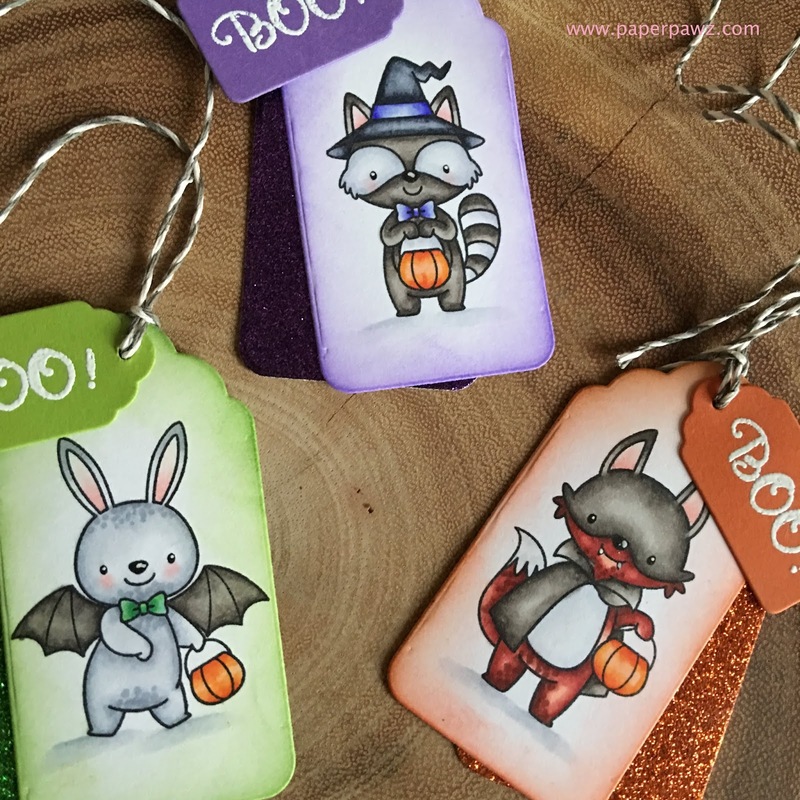 I had to use these sweet Halloween critters from the MFT Frightfully Sweet stamp set, I have been wanting to color these guys since I picked up this set last month. I die cut three tags with Neena 80lbs cardstock using the the Simon Says Stamp tag die. I then place my tags in my Mini Misti and stamped my images with Lawn Fawn Jet Black ink safe for Copic coloring. Once that was complete I used Mowed Lawn, Ripe Persimmon and Wilted Violet Distress Inks to ink the edges of my tags in coordinating colors. I then die cut three more tags out of Simon Says Stamp Glitter paper in the same color families to add to the back and offset the white tag. 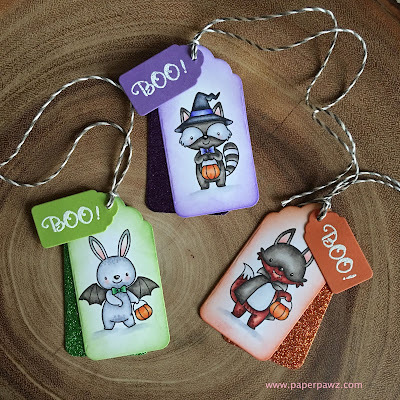 I used the smaller tag from the same Simon Says stamp die set and die cut regular cardstock so that I could white emboss my "Boo!" sentiment and add it to the top of the tag with some Lawn Trimmings twine. These are going to be fantastic to add to Halloween treat bags! LOVE the glitter card behind, and the colors are spot-on for Halloween! Adorable projects for this week's challenge! Oh those critters are so so cute, Kim! Love how you used different colors for each and the small BOO tags as well. Such delightful variations! Fall flower with color inspiration! A Blog Named Hero - Fall Color Palette! Simon Says: Let's Get Ready for Christmas!